Don’t look now, but the humble industrial PC laboring away on a shop floor or tucked behind a large digital display may be poised for a change. More and more commonly, small ruggedized PCs are tackling compute-intensive tasks that call for powerful graphics hardware. But enabling leading-edge performance in a fanless, solid state system is hard to do, as it must balance cooling capacity, power consumption, cost and system reliability. Driving this evolution of IPCs are industrial and commercial applications that thrive on top-end computation and graphics performance. Medical imaging, for example, requires extreme visual fidelity with minimal latency, while shop floor CAD and CNC workstations must provide responsive design experiences in punishing environments. From multi-screen video walls to real-time machine vision that detects manufacturing flaws, high performance IPCs are changing the game. Deployments that have always valued reliability, consistency and availability of replacement parts, today also demand cutting edge graphics processing. A typical consumer-grade high-performance PC boasts multiple fans and heatsinks, with powerful GPUs that can pump out 200 watts or more of thermal design power (TDP). This kind of approach is problematic for IPCs, which leverage solid state designs for maximum efficiency and reliability. But it’s becoming more and more common to find industrial solutions that bridge the gap. Modular, cassette-based designs, for instance, enable a fanless, sealed-case IPC to accept a discreet graphics card module, complete with fan and heatsink. 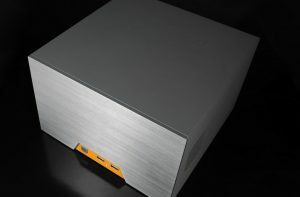 The arrangement makes it possible to leverage powerful GPUs for specific computational tasks – like image analysis and display. This modular approach allows for the GPU cassette to be easily to swapped out for service or upgrading without requiring replacement of the entire system. The Nuvo-5095GC system from Neousys is an excellent example of this approach in action. Another solution utilizes the range of available low profile, lower power half-height graphics cards, which run directly off a standard PCI-e expansion slot, helping reduce cost while offering a compact footprint and efficient cooling. Half-height graphics cards (sometimes called mini-cards) are effective for graphics subsystems with a TDP below 75. The Cincoze DS-1100 is an example of a system that employs this type of solution. Custom motherboard designs can also help combat some of the key GPU complications by strategically positioning components for maximal cooling and electrical efficiency. 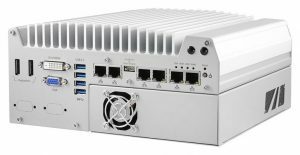 However, the small surface area of compact IPC cases are a challenge, and case temperatures must stay low enough that they don’t threaten to burn users who touch them. Ultimately, this solution relies on the continued advancement of graphics processing technology, which promises higher computational performance without higher thermal output. Of course, not all industrial PCs are fanless. In applications where environmental concerns aren’t as prevalent and active cooling can be tolerated, users can elect to integrate dedicated graphics solutions into a fanned chassis. In the past, systems that utilize standard GPU integration methods have been bulky and difficult to install in situations with space constraints – a common concern for OEM machine builders and system integrators. Our recently released MC850-50 system was designed to enable advanced processing in a small footprint for control room, edge computing and industrial automation applications that aren’t subject to adverse environmental conditions. There are a range of commercially available solutions that mate muscular GPUs with power-hungry CPUs, but few graphics hardware suppliers offer reliable availability of parts and guaranteed component manufacturing life spans of five years – typically the minimum threshold for industrial PC deployments. The result: Many of the other graphics-savvy IPCs on the market can be tricky to service due to lack of timely spare parts and/or equivalent configurations. There are some exceptions to the lifecycle dilemma. AMD currently offers versions of its embedded Radeon graphics controller with a five-year manufacturing lifecycle, specifically with its AMD Radeon G and E series cards. The AMD ER91FL PCI-e based graphics card with Radeon E6460 GPU is one example. But with the specific requirements of many industrial computing, automation and IoT applications, finding the graphics card and system combination that works for every situation is nearly impossible. Logic Supply is working with leading vendors to promote longer lifecycles and lock down component availability. In the meantime, we work with customers to help proactively manage component inventories and plan for product end of life events. This includes helping transition existing configurations to current parts and providing testing and other services to ensure a smooth transition, and the continued success, of ongoing projects that require dedicated graphics processing. The role of IPCs is evolving, and the challenge of managing IPC deployments is evolving with it. To ensure that systems meet both your performance and reliability targets, take the time to consider all your options, while staying informed of the challenges that face any high-performance, graphics intensive IPC project.